This stir-fry is a great way to use extra roast chicken that you’ve cooked in advance, but store-bought rotisserie chicken is another option for the meat. The rich coconut rice is the perfect counterpoint to the soy-jalapeño sauce. For color, add some red bell pepper to the stir-fry. Heat 1-1/2 Tbs. of the ginger with 2 Tbs. of the oil in a small (2-qt.) saucepan over medium-high heat until it begins to sizzle steadily and becomes fragrant, 1 to 2 minutes. Add the rice and cook, stirring, until the grains and ginger start to brown in places, about 2 minutes. Stir in the coconut milk, 1-3/4 cups water, and the salt. Bring to a boil and then reduce to a simmer. Cook until the liquid has reduced to about the same level as the top of the rice, 5 to 7 minutes. Cover, reduce the heat to low, and cook without disturbing the rice until the liquid is absorbed and the rice is tender, 15 minutes. Meanwhile, whisk together the soy sauce, rice vinegar, brown sugar, and cornstarch in a small bowl .Stir in 1/2 cup water and set aside. In a large skillet over medium-high heat, cook the jalapeños and the remaining 1-1/2 Tbs. ginger in the remaining 2 Tbs. oil until they sizzle steadily for about 30 seconds. Add the snow peas and cook until bright green and browned in places, about 1 minute. Whisk the soy mixture to recombine and add it and the chicken to the skillet. Cook, stirring, until the sauce thickens and the chicken just heats through, about 2 minutes. Stir in half of the cilantro, reduce the heat to low, and cook for another 2 minutes. 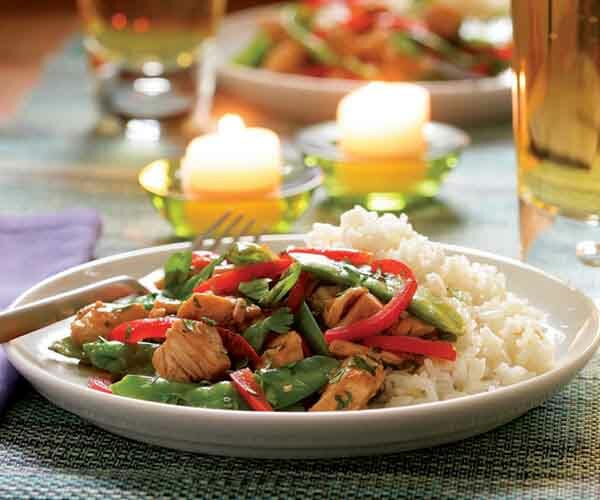 Fluff the rice with a fork and serve with the chicken and snow peas, sprinkled with the remaining cilantro. 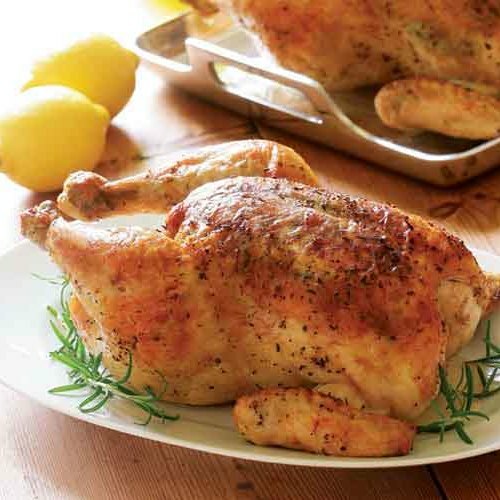 Find more recipes like this one in 150 Things to Make With Roast Chicken, by Fine Cooking contributing editor Tony Rosenfeld. Get two meals in one, with 50 ideas for roasting the bird, plus recipes for casseroles, soups, stews, wraps, salads and more using the leftovers.